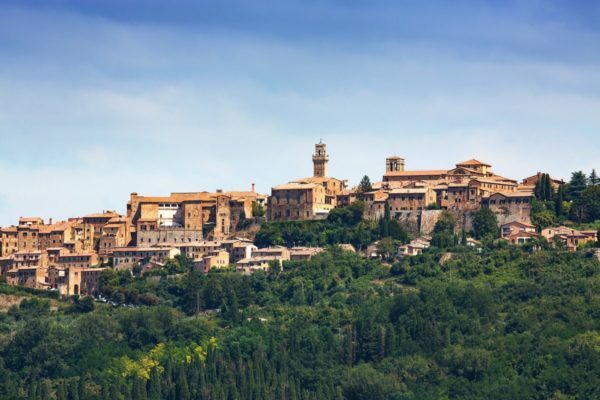 The village of Montepulciano is located in the South-East of Tuscany and has a history that boasts ancient origins and that has led the prestige of its customs and traditions up to our time. 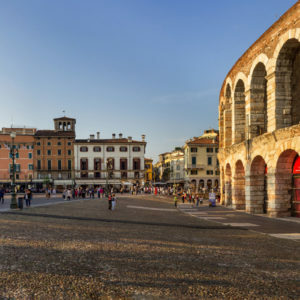 The numerous influences that distinguished the physiognomy of the city are evident from its name, Roman deformation of the Etruscan purth that meant commander or general. Even if prehistoric finds were found in the area, to suggest an allocation already present at the time, the municipality of Montepulciano, according to the findings and documents examined by some historians and found near the Fortress in 1989, was born between the fourth century BC as a settlement of the Etruscan population and in particular from Porsenna, Lucumone di Chiusi. The Roman era instead sees Montepulciano constitute an important junction for the protection of the viability of the Republic and the Empire. 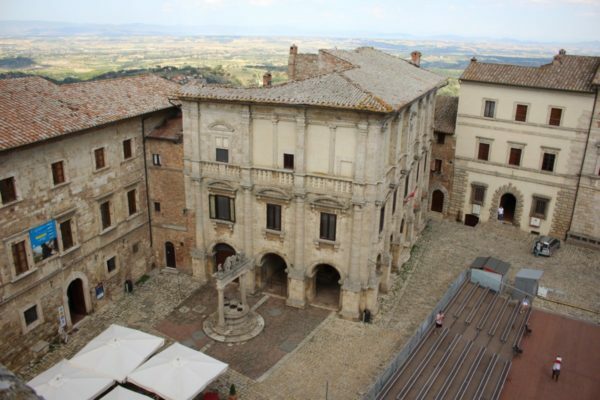 However, the first documentary quotations in the history of Montepulciano date back to the Longobard era, between the years 713 and 715, with the name of Mons Politianus , Castello Policiano. 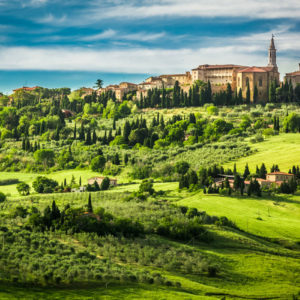 The destiny of Montepulciano largely followed that of Florence and in the eighteenth century, the town was noted for the flowering of the Accademia degli Intrigati, a cultural association that brought numerous improvements to the area. The agricultural re-colonization and the reclamation of the Valdichiana (begun in the 16th century under the Medici family, but completely completed between the 18th and 19th centuries under Pietro Leopoldo dei Lorena-Asburgo, after many clashes between the Grand Duchy of Tuscany and the Papal State and thanks to the construction of the Chiana master canal) favored the economic recovery and the advent of the modern Montepulciano, homeland of traditions and good wine. In 1984, Montepulciano passed from the province of Arezzo to that of Siena. 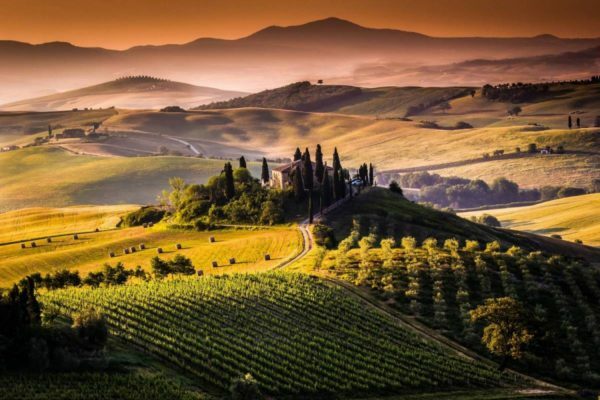 The Vino Nobile di Montepulciano, along with Chianti and Brunello di Montalcino, is one of the 3 most famous Italian wines in the world. In Montepulciano are produced the DOCG “Nobile” and the DOC Rosso di Montepulciano, Vin Santo, Chianti Colli Senesi and Bianco Vergine Val di Chiana. The Nobile is the ideal wine to accompany the local cuisine, which offers simple but robust and tasty products and dishes: ham, tasty crostini with spleen and fegatielli, pansanto and crunchy bruschetta. The typical dish is the pici: handmade spaghetti, which were once prepared by farmers who could not afford meat or other more expensive foods, seasoned with meat sauce. To taste also pappardelle with hare sauce, bread soup, porcini roasted on the grill accompanied by ciaccia, crushed bread dough dressed with oil, or fresh bread, rigorously without salt to leave room for all other flavors. As for the desserts, delight yourself with the cantucci biscuits, almond biscuits, to be soaked in the Vinsanto. Montepulciano, famous for the wine to which it gives its name, stands on a hill 600 meters above sea level: from this height it is easy to get lost with the look among the green Tuscan hills, the olive groves and vineyards and the cypress trees that mark pleasantly all the landscape. From the Tower of the Renaissance Palace of Montepulciano, the look reaches the Sibillini Mountains and Cimone and when the air is particularly clear even the Gran Sasso d’Italia in Abruzzo. The historic center of Montepulciano, in Tuscany, winds along a single main road (called the Corso) that starts from the lower part of the city to the Piazza Grande. Outside the walls, there are the Church of Sant’Agnese with the original gothic portal and the balinese facade of Viviani, the Medicean Fortress of Sangallo and the fourteenth-century Gracciano gate restored by Sangallo in the early 1500s. historical center just from the Porta di Gracciano and a little further on, to the left of the Marzocco column, precisely in Piazza Savonarola, is the church of San Bernardo. On the right side of this road is the Palazzo Avignonesi del Vignola, but also other Renaissance palaces including the Bucelli, in whose base there are many cinerary urns and various Etruscan and Latin stones and inscriptions. This road, looking like a refined 16th century street and home to many patrician palaces, consists of the three segments of the streets of Gracciano, dell’Opio and Voltaia. In via Gracciano, on a stairway with a balustrade, stands the lovely fifteenth-century church of S. Agostino with the façade of Michelozzo. Inside the church we highlight the works of Giovanni di Paolo, Lorenzo di Credi, Antonio del Pollaiolo and a pupil of Pomarancio. Also in Piazza Michelozzo you can see the Tower of Pulcinella with the typical mask that beats the hours. 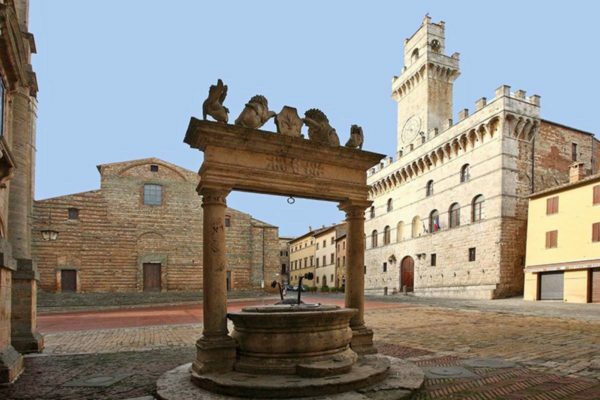 Piazza Grande in Montepulciano: This square is the heart of the city where tourists and locals meet every day. In the summer it comes alive in an extraordinary way thanks to the theatrical performances of the famous International Art Workshop and on the last Sunday of August it hosts the competitors of the Bravìo delle Botti, with the representatives of the eight Poliziano districts that have the task of pushing the big barrels for the village. This area, made harmonious in the ‘400 by Michelozzo, is made up of many prestigious buildings such as the fourteenth-century Palazzo comunale, which recalls Palazzo della Signoria in Florence, Palazzo Contucci, begun in 1519 by Antonio da Sangallo the Old and concluded by Baldassarre Peruzzi, and the Nobili-Tarugi palace, covered in travertine. Next to this last building there is the typical fourteenth-century structure of the Palazzo del Capitano del Popolo in brick, in front of which is located the well of Grifi and the Leoni with elegant renaissance forms. The large, unfinished facade of the Duomo closes in beauty on the south side of the square. This imposing building was built according to the project of Ippolito Scalza between 1592 and 1630, restored later, in 1880. Inside you can admire the triptych of the Assumption by Taddeo di Bartolo, the Madonna and Child of Sano di Peter and to the left of the central portal, the lying statue of Bartolomeo Aragazzi, poet and secretary of Martin V, by Michelozzo. Via Ricci: This street is the commercial center of Montepulciano, along which renaissance and medieval residences of the poliziana bourgeoisie line up. At number 10, in the Gothic Neri-Orselli palace, there are the Museo Civico and the Crociani Art Gallery. The museum, which is currently closed for renovation, includes the Crociani collection and paintings from churches and convents. A collection of paintings from the Sienese and Florentine schools from the 13th to the 18th centuries and a rich collection of enamelled terracottas belonging to Andrea della Robbia are exhibited. At the num. 11 instead Palazzo Ricci, accused to Baldassarre Peruzzi, welcomes the Historical Archive and the Municipal Library which has an ancient fund of 15,000 volumes. The Rodi wine cellar, in which the noble wine of Montepulciano is kept, occupies the basement of this building and is considered one of the most scenic wine cellars among those found under the city’s historic buildings. 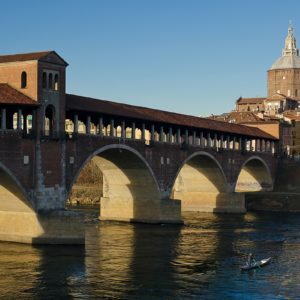 Capital of the Lombard kingdom and home to one of the oldest Italian universities, Pavia is undoubtedly a city with an important past, of which extensive traces are preserved.